May 15, 2017, 10:00 PM · I was trying to impress my daughter, 19, with my new electric violin, which admittedly, I have no idea what I'm going to do with, other than try to mitigate a kind of mid-life classical musician crisis. "Isn't it cool?" I said, plugging in the new five-string Yamaha Electric Violin and showing Natalie, as she lounged on the nearby couch, checking her phone. Though she doesn't play the violin, she has had the strange life circumstance of growing up amid hundreds of hours of ambient violin-lesson noise. She also has wide and eclectic tastes in music, from rap to classic rock, alt music and folk to "Claire de Lune." "I just have to figure out what to play on it," I admitted. She looked up. "Hmmm. How about....'Come On Eileen'?" she said, fiddling with her phone. The 80's pop song came pouring out of her phone. So I started playing along. Actually there's a lot of violin in that tune, and nice little licks. Once I'd figured them out, I tried to change them up a little. "How do you do that?" she said. "Okay here's another one." Bohemian Rhapsody? Sure, why not? I picked out the melody here, the harmony there, took a stab the guitar solo...Pretty fun, actually! "Okay give me another one," I said. How does she even know that song, isn't it from the '70s? But actually it's kind of lovely on the violin, you can poke it up an octave in places, add a few little things here and there...I was actually having quite a lot of fun. "Mom, how can you do that?" Play by ear? Come on, I'm a Suzuki teacher! It was nice that she was impressed, but it was pretty clear to me that this is an extremely underdeveloped aspect of my playing: the ability to play by ear and improvise. Too much stumbling. And why can't I just immediately play what I hear in my head? Is there a way that I can strengthen that connection? And certainly I was playing it awfully safe. Well, my daughter would be going back to college, so no one would be giving me another musical improv quiz session any time soon. That's when I remembered Christian Howes, who contributes the occasional blog to Violinist.com. His stated mission in life is to "help classical string players improvise and develop creativity in different musical styles." I've attended a number of his workshops and found them intriguing. I remembered, he has a summer camp called Creative Strings Workshop -- in fact, there is a division of it for adults. Later, I found myself talking to my stand partner at a symphony gig about my new electric violin. "What are you going to do with it?" she said. "I think I'm going to go to a summer improv camp," I said, not missing a beat, "for fun." To be honest, I didn't know I had such a plan. "For fun?" she said, arching an eyebrow. "Imagine that." Maybe it looks something like this? Symphony musicians occasionally get a little jaded, I must say. It really might be time to stretch out a bit. So with some trepidation, I've signed up to go to Christian Howes' Creative Strings Workshop, in early July, in Columbus, Ohio. And after signing up "for fun," I've realized I've actually signed up for a lot of work! It will certainly involve some brain-stretching, practicing, and getting way out of my comfort zone. How exciting! And of course, you'll be getting some blogs about it in July. Wish me luck! What would be really cool would be for someone like Howes or even v.com to team with Aebersold to do a special one for string players. Louisville is a great location for many of us. I see that Christian Howes's workshop is in Columbus, though, so that's even closer to where I live. Too bad that week doesn't work for me, I have to teach. This sentence in your essay struck me: "...it was pretty clear to me that this is an extremely underdeveloped aspect of my playing: the ability to play by ear and improvise." Well, you're not alone. And that's what Mark O'Connor has been preaching for 20 years. His mistake, of course, was to make Suzuki his adversary instead of his ally. 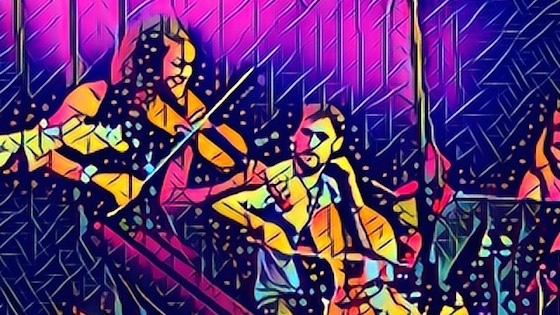 May 16, 2017 at 03:52 PM · That cool photo looks like a Prisma creation. Is it? I got Prisma a while ago and I love it. It really can turn ordinary phone pictures into works of art. I think outside of standard classical training there is quite a bit of interest in and support for improvisation. Val Vigoda talked about that last year in the interview I did with her. She is teaching improvisation in schools with Mark Wood's "Electrify Your Strings" program. May 16, 2017 at 04:22 PM · Prisma pictures are cool but I'm not so sure about "works of art." May 16, 2017 at 04:42 PM · It depends on the picture. I don't think professional portrait artists and photographers have anything to fear from Prisma. But I've used it on some of my own photos and was quite surprised and pleased with the results. May 16, 2017 at 06:22 PM · It's a nice tool for making graphics, along with Photoshop etc. Ever experimenting! May 16, 2017 at 07:40 PM · If you can't get to Christian Howes' workshop, try looking up a local jam. I regularly go to bluegrass jams, but you should be able to find them for folk, Celtic, pop, jazz... pick your genre. Many of my fellow grassers, some of them quite accomplished, can't read a note of music - it's all improvisation and playing by ear. And late at night, when everyone is getting into the groove, magic happens. At our last session someone started playing Eric Clapton's "Lay Down Sally", and suddenly we were all rocking out. So try it! As with anything else, the more you do it, the better you get. Pretty soon you're losing yourself in the music; somehow the mechanics of playing become automatic and you're pulling out smooth licks with a sweeter tone than you get when you try too hard. It's a tremendously liberating experience, and great for developing your musicality. May 16, 2017 at 08:05 PM · I agree with Charlie about local jams. But like any kind of ensemble playing, they are the most effective and enjoyable if the participants are at approximately the same level with regard to skill and musicality. That's why my approach has always been to get to know a lot of musicians in my own area and then I can organize the jam myself -- by invitation. May 17, 2017 at 12:46 AM · In my practice room at home I often warm up by improvising a folk tune - usually in an English or Irish genre, both of which I've been familiar with for many years. It's not difficult when you understand the formal structures of the tunes in those genres (they're mostly for dancing), their usually fairly straightforward harmonic content, and the ornamentation. Actually, I'd never improvise a tune in a traditional Irish or English folk session, because I'd probably get asked some unintentionally awkward question about the name of the tune and where I learnt/heard it, which I couldn't possibly comment on! Not to mention the embarrassment of being asked to play the tune a week later and not being able to remember it! "Up to this day, I start every day by improvising for about 20 minutes," he said. "One of the reasons I do this is I want the path from thought to output to be instant. I'm personally against this thought of controlling everything, looking at the bow and looking at the fingers; I think the brain works best if you can sort of set it free. And if I need to work on some basic technical thing, I still do that as an improvisation. It's much more fun!" The local jam sounds fun, but yes, the key is to find compatible people to do it with! May 17, 2017 at 07:15 AM · Being 62 I learned to improvise from age 17 and yes with electric fiddles too: handmade solid body and Barcus Berry violectra. May 17, 2017 at 11:24 PM · Laurie, jammers are traditionally very welcoming. A jam session often starts as a slow jam, playing relatively uncomplicated tunes that most people know. There are also slow jams that last for the entire session and jams that are described as being for all accomplishment levels. Get out and try some and see where you have the most fun. May 18, 2017 at 09:07 AM · Hi all, I used to jam a lot, there I learned to improvise, after many years of classical training. I professionally played pop rock, salsa blues etc. But always kept playing classical music, above all Bach and barok music. Living in Amsterdam, many places where one can jam. I love it, especially cause electric violins are not so common on stage, the audience expects awful sounds and are amazed when there is this lovely, raw sensitive fiddle. May 18, 2017 at 04:13 PM · Thanks everyone! This is sure to be an adventure! May 19, 2017 at 07:02 PM · Pauline wrote, "Laurie, jammers are traditionally very welcoming." That depends. There are jams where you'll be scolded if you try to set up a stand for a fake book. I learned to improvise very early in life (ca. 12 yo) on the piano and I became, over time, a decent jazz pianist. I am a founding member of "Highlands Jazz" and we have been playing gigs regularly in various groupings, from duos to our full quintet (sax-piano-guitar-bass-drums) throughout the area for ten years. I thought that I would be able to transfer those skills to the violin but found it much more difficult. The violin is much more demanding because of one thing: Intonation. When you are learning a classical piece, you can go over it and take care of the intonation phrase by phrase, section by section, before you perform it. When you are improvising, you're coming up with each phrase, on the fly and at full tempo, so unless you have a very reliable command of the fingerboard, what is in your mind's ear may actually come out as notes, but they will not be in tune. Part of the problem is that jazz tunes are in a lot of different keys. Even tunes that start out in G major will wander into other keys because, frankly, jazz standards embody a lot more harmonic movement than the average johnny-three-chord folk-fiddle tune, and the chords are not all major and minor triads. You can't get away with blowing the whole tune over a single scale. I semi-solved that by joining with two other Highlands members (the guitarist and the percussionist, both pros) to form a violin jazz trio. What makes it work is that the tunes are all Brazilian tunes (bossas, modinhos, etc.) These are generally a little more harmonically static than most swing standards, and they're often in friendlier keys. Also playing straight eighths is a lot easier than swinging them. So far, so good. Maybe someday when I do not have so many irons in the fire I will be able to make more of a college try at jazz standards.